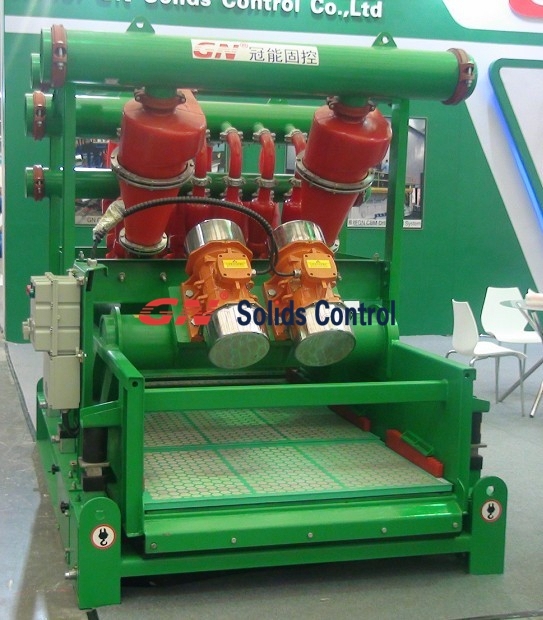 Mud recycling system is used for the separation process in the drilling cuttings, sediment and other particles, so as to maintain the circulating drilling fluid’s performance and storage. In order to meet the needs of the drilling work, the mud recycling system should improve the physical and chemical properties of the fluid. Mud cleaner is the second and the third equipment of solid control system,Mud cleaner is mentioned the combination of desander and desilter. Generally, a desander and a desilter will be installed after shale shakers in a solids control system. On the other hand, the combination of a desander and desilter, acknowledged as mud cleaner can substitute the desander and desilter. At present, we did the practice of putting together a set of mud cleaner with technicians. It is absolutely a time consuming experience, but reaping helpful benefits. First of all, two different size hydrocyclones ought to be mounted on the manifold assembly. The 10” cone is for desander, that can separates solids of different size from 40 to 100 microns. The 4” cone is for desilter, which can separates solids of varied size from 16 to 50 microns. Regarding the two cone’s structure, both of them take the shape of a cone, but the desander cone is assembled by the shell, big cone tube , and small tube tone, the three pasts be lined and fixed by clamps; the desilter cone is a complete cone, but needs an elbow when installed on the manifold assembly. Today we did try our best to install the cones on the manifold assembly. Firstly, although there are rubber ring for clamps, we have the clamp inside coated with sealant for better sealing. And then one of the technicians showed us how link the elbow to the cone. It seemed simple to put the rubber ring on one end of cones, and the put one end of elbow into the rubber ring, and then fix it with clamp. But we when have a try, it is totally not easy. We were just thinking the technician must have magic power leading the rubber ring to its position, or the rubber ring is alive, he turned against us and caused tough problems. In china we have an idiom ‘Shu Neng Sheng Qiao’ it means practice makes perfect. That may explains why it is tough for us to do this job. When all cones were installed, fatigue seems like a snake wending its body on my body, but I am thinking it is also exciting and benefiting, isn’t it?